I mentioned at some point that my husband does not like birthday cake, so every time we celebrate a birthday in the family I try to make a dessert for my husband and so he will also be able to enjoy the celebration. 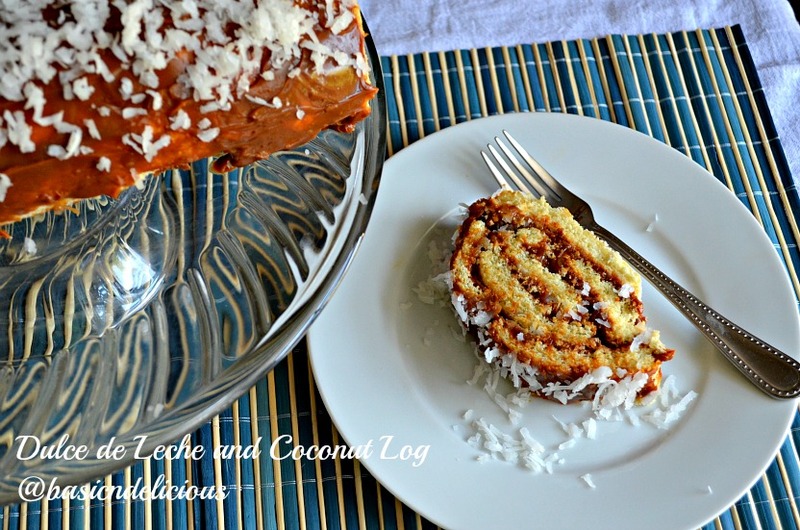 This time I made this delicious log or roll filled with Dulce de Leche and coconut, to the surprise of many, it is very easy to make and incredibly delicious. It was so popular that the poor cake remained almost in one piece that day. There is no way look bad with desserts like this and believe it or not take the picture was also difficult. No reason to stop enjoying a celebration when they do not particularly like any dessert because the main reason is to have fun as a family. So I hope you enjoy this rare substitute for a birthday cake, surely delight the whole family. Place the egg whites in a mixer and beat until stiff peaks, add the egg yolks one at a time and one cup of sugar gradually, add vanilla and coconut extract. In a bowl sift together the flour, cornstarch, baking powder and salt, lower the mixer speed and slowly add to above mixture along with the butter. Place on a tray lined with parchment paper, spread the mixture well and bake for 12 minutes. Once ready, and when still warm sprinkle with remaining sugar, place a piece of parchment paper over the back and a roll, let it cool completely. Once cool spread and fill with Dulce de Leche and coconut, roll again and decorate with more dulce de leche and coconut. This entry was posted in Uncategorized and tagged baked, coconut, dulce de leche by Kathia Rodriguez. Bookmark the permalink.